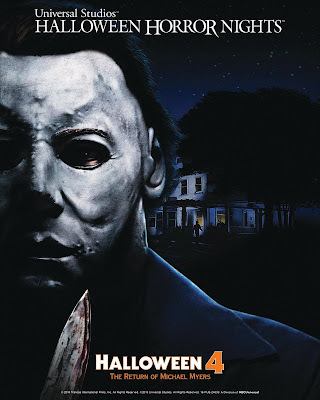 Beginning on September 14, "Halloween 4: The Return of Michael Myers," from Trancas International Films, takes a stab at Universal Studios’ Halloween Horror Nights, bringing the notorious slasher to Universal Studios Hollywood and Universal Orlando Resort in all-new mazes inspired by the iconic horror film. Based on the fourth installment in the classic slasher series created by John Carpenter, the mazes will transport guests to the suburban town of Haddonfield, Illinois on Halloween night where Myers has escaped Smith’s Grove Sanitarium and is hungry for revenge. This time, he relentlessly stalks his niece Jamie as his next victim, stopping at nothing to kill her. Guests will follow Myers as he escapes the mental hospital, encounters his first victims at Penney’s Gas Station and Diner, and wreaks terror on Haddonfield, all set to Alan Howarth’s ominous score. The maze will include horrifying scares by Myers in his classic featureless white mask and navy jumpsuit, with guests dodging his bloody knife at every turn. Halloween fanatics can expect a cameo by Myer’s psychiatrist Dr. Loomis and other famous characters from the film as they try to escape the bloodbath. Universal Studios’ Halloween Horror Nights is the ultimate Halloween event. For more than 25 years, guests from around the world have visited Halloween Horror Nights in Hollywood and Orlando to become victims inside their own horror film. Multiple movie-quality mazes based on iconic horror television shows, films and original stories come to life season after season. And, the streets of each coast’s event are transformed into highly-themed scare zones where menacing scare-actors lunge from every darkened corner. Additional details about Universal Studios’ Halloween Horror Nights will be revealed soon. For more information about Halloween Horror Nights at Universal Studios Hollywood and Universal Orlando Resort, visit HalloweenHorrorNights.com. All tickets and vacation packages are on sale now. Updates on “Halloween Horror Nights” at Universal Studios Hollywood are available online at Hollywood.HalloweenHorrorNights.com and on Facebook at: “Halloween Horror Nights – Hollywood,” on Instagram at @HorrorNights and Twitter at @HorrorNights as Creative Director John Murdy reveals a running chronicle of exclusive information. Watch videos on Halloween Horror Nights YouTube and join the conversation using #UniversalHHN. Universal Orlando’s three theme parks, Universal Studios Florida, Universal’s Islands of Adventure and Universal’s Volcano Bay, are home to some of the world’s most exciting and innovative theme park experiences – including The Wizarding World of Harry Potter – Hogsmeade and The Wizarding World of Harry Potter – Diagon Alley. Universal Orlando’s on-site hotels are destinations unto themselves and include Loews Portofino Bay Hotel, the Hard Rock Hotel, Loews Royal Pacific Resort, Loews Sapphire Falls Resort, Universal’s Cabana Bay Beach Resort, and coming this August, Universal’s Aventura Hotel. Its entertainment complex, Universal CityWalk, offers immersive dining and entertainment for every member of the family. Universal Orlando Resort continues to unveil all-new guest experiences, including powerful attractions, incredible dining opportunities and dramatically-themed hotels. Now open is Fast & Furious – Supercharged, where guests can join the Fast family and step into the blockbuster Fast & Furious films at Universal Studios Florida. And at Universal CityWalk, Voodoo Doughnut is now serving more than 50 types of delightfully weird and sinfully delicious doughnuts. Trancas International Films, Inc., along with its subsidiary Compass International Pictures, Inc., is a film production and distribution company based in Los Angeles and operating worldwide with a library of classic and revered films, such as John Carpenter’s Halloween, The Message and Lion of the Desert. Trancas has been involved in the production of every film in the Halloween franchise, including the upcoming Universal release directed by David Gordon Green and starring Jamie Lee Curtis. In addition to partnerships with Universal, Trancas has deals with Miramax, Blumhouse, Lionsgate, Anchor Bay and Dimension Films, among others.